Emails and their respective landing pages are a highly efficient way to communicate with customers and potential customers. Especially if they've volunteered to recieve your company's information. As a passive communication, email and landing pages give the opportunity to provide a tight, direct message with links to additional information and clear calls-to-action. If it's a strong product offering, then it's a safe bet to let the customer decide. 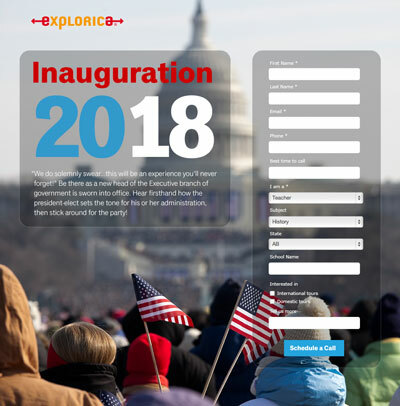 That's why we were able to convince Explorica to revise it's email template for more versatility in messaging and its landing pages for more flexibility in representing its product offering. The educational travel market has traditionally had more of a personal touch. The primary target market is middle- and high-school teachers. Teachers need to understand that Explorica is safe, cost-effective, and provides unique educational opportunities for student. This project is ongoing, but some results have been gathered and shared below. A direct communication from a Sales representative regarding an upcoming deal that the recipient may wish to share with colleagues. A simple and direct communication intended for the recipient only and not at all intended to be shared. Super-sweet and awesome promotions that should be shared. Obviously, the 2009 template had far outlived its purpose. Redesigning the email template(s), besides modernizing the pieces, reorganized the content for reading efficiency. For instance, there are several pieces of information required to be in email, but it's not necessary for them to all be at the top. We want the viewer who has been intrigued by the subject line, to open the email and read the main message, reinforcing the subject line. Any photo used should emphasize the message, but a basic default would be students on tour enjoying some form of culturally immersive experience. At the bottom of the page, we wanted teachers to always know that there was a referral bonus waiting for them. Finally, we included only the social media the company is actively engaging and followed that with any legal information. Three similar templates. Each intended for different communication needs. In addition, we've been able to include lead-nurturing emails that are not tied to the sales cycle or particular, time-sensitive deals. For instance, Explorica can feature new tours and activities to continue to build familiarity with its audience. Since organizing a tour is a longer-term process that involves a significant amount of money, we want customers to be informed and confident they're making the right decision. Using common research, we were also able to jettison the bias that image-based emails are a problem. We carefully designed the pertinent content to be displayed regardless of whether the images themselves are loaded initially. Graphics support the message, but are not the message themselves. Historically, Explorica's email has had an average open and click-through rate of approximately 7%. The following emails, one to announce a Cuba tour and another for Canadian war history, averaged an open and click-through rate of 16/15% and 18/15% respectively. 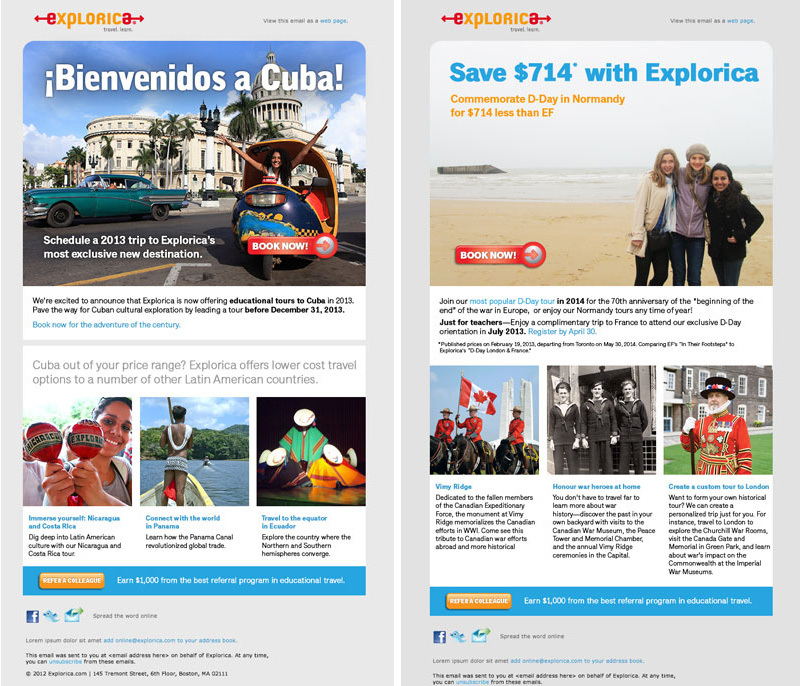 Cuba and other new tours announcement and Canadian war history promotion. With the redesign and the launch of several emails, the company has been able to gather some interesting and helpful analytics. For instance, nearly 50% of emails are being opened on the iPad. Could that mean we might customize content for iPad users? It's certainly a fair possibility that such information could open up entirely new paths for communicating with customers in more interactive ways. The landing pages needed to be more versatile as well. Sometimes they'd function as a microsite and other times they'd be entirely focused on one subject (a particular event or tour) or as a generic landing page (from Google PPC ads, for instance). To that end, three base templates were developed, the common element amongst each was to include a form to gather further customer information. With multiple tabs, this template could serve multiple purposes as a microsite. Virtually everything within the template is customizable; from the image banner, to the form, to the number of tabs. An example of a page entirely focused on a particular event. A generic page intended to demonstrate that any type and graphic combination could be used. Let content guide the visuals.